Just when you think you have it nailed, British cinema proves perpetually surprising. Take Bernard Knowles for instance. His is a name unfamiliar to the vast majority of the general public (and even to most film historians I’ll be bound), yet his 40 year career contains films that many will have seen. Knowles began in the late 1920s as cinematographer, and shot five Alfred Hitchcock films in the 1930s- including most of the films that would make the director’s name and ultimately take him to Hollywood. Knowles, however, carried on behind the camera- until Love Story in 1944. The following year, he made his directorial debut with A Place of One’s Own, and subsequently worked on television programmes. His last two films as director were made in 1967, one of which being The Beatles foray into television psychedelia Magical Mystery Tour. Easy Money, though, goes back to those early days of Knowles as director- and his work with some notable British acing talent headed by Jack Warner himself. 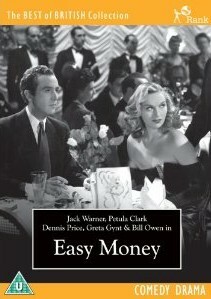 Easy Money revolves around the possibility of ‘getting rich quick’, an idea that is at the root of many successful films even today. In this case, it is the football pools that is at the heart of the quest for wealth- the possibility of becoming very rich very quickly being a major attraction in the austere postwar world. Interestingly, the portmanteau film is headed by Jack Warner- a recognisibly paternal figure making the first of four film appearances that year. Although stage actress Marjorie Fielding may not be a familiar face in the cast list, others are- Petula Clark, Disney favourite David Tomlinson, Maurice Denham, Mervyn Johns and Dennis Price are just some of those who appear, although Greta Gynt takes top billing along with Price and Warner. The strength in Easy Money is largely the idea- as with Train of Events (also available from Odeon Entertainment), the basic outline is told through multiple stories all united by one main force- in this case getting rich on the football pools. But, a good film relies on more than that- and at times Easy Money just does not have the assurance of some of the great portmanteau films (such as Dead of Night). Whether this is down to one man (Bernard Knowles) being responsible for all four mini narratives it is impossible to say for sure, but the upshot is like eating a meal that should be at the least very good (and possibly excellent) and being slightly under-whelmed. ‘All the world loves a gamble’ says the disembodied voice-over narrator, amidst glimpses of all the things it is possible to bet on (interestingly, not including which of the four segments of this portmanteau film will be the best). The first (and by far the longest) segment showcases the Stafford family, whose pools win turns sets them at loggerheads, in a potentially moralistic tale which is contrived and downright dull. A film such as Easy Money relies on its opening story being eye-catching and fluid, two epithets that could not be applied to the lacklustre and caricature family headed by Jack Warner. Segment two (revolving around Mr. Atkins, brilliantly played by Mervyn Johns as a hen-pecked husband who succeeds on the pools) is by far the best of the entire film, the interesting uses of technique (such as us hearing Mr. Hessian but never seeing him) causing this to stand out. The third segment features Mr. Lee (who is addressed by the voice-over, to which Lee replies!) and the deceitful couple of Greta Gynt and Dennis Price in the so-called ‘Nightclub Case’. This is a neat twist on the other segments, as Joe Henty (Price) actually works for the pools company, and attempts to win from within as it were. This is satisfactory entertainment, and its detective-style narrative leaves the viewer feeling they have had enough even before the final segment hoves into view. This is a rather tiresome narrative concerning Edward Ball, a double bass player, and the film ends at the end of this segment without a return to the voice-over which would have given the film a cyclicality it is otherwise missing. All-in-all, it isn’t hard to see why Bernard Knowles isn’t as celebrated as some of his contemporaries, but Easy Money does have its moments- just not enough of them. The overall tone of the film seems to be one of warning- the irony of the title signifying that large sums of money can’t buy you happiness, an assertion that this writer would dearly like the opportunity of testing out. ‘Easy Money' is available on DVD from Odeon Entertainment.